The daily routine for the average American involves waking up and traveling 25.4 minutes* to get to their workplace. For most people, that’s just reality; This is how our cities are built, and spending hours of your week in transit is unavoidable. But with the recent resurgence of live-work developments and complete, walkable communities, more and more people are getting the option to live and work in adjacent spaces—and in doing so are able to be free of the daily commute once and for all. The idea of living and working in adjacent spaces may be a good one, but the concept is not new. Prior to the early 20th century, practically everyone worked next to or near their living spaces. Doctors, shop-keepers, tradespeople, professionals of all sorts typically lived in spaces above or behind their workplaces. It made sense; living and working in the same place was often the most practical and convenient option. But with the emergence of post-war automobile culture and Euclidean urban planning—i.e. the practice of zoning areas for one single use, thereby separating industrial areas from housing areas and commercial areas and so on—living in suburban areas and commuting to work became the desirable norm. Our cities spread out further and further, and so did our daily commutes. A renewed interest in live-work development began in the 1970’s and 80’s when developers started turning empty manufacturing plants and warehouses into artist lofts. Since then, the idea of the warehouse artist loft has gathered a legacy of cool—who doesn’t want to go to a party at an artist loft?—but more than that, this type of development heralded the beginning of a much wider and more varied movement towards reclaiming urban spaces as complete communities, rather than ones designed to be used only between 9 to 5. Coaxially, as the cost and time involved in commuting to and from the suburbs rose, people have begun to increasingly move back into our cities. In few places is that as readily apparent as our hometown. 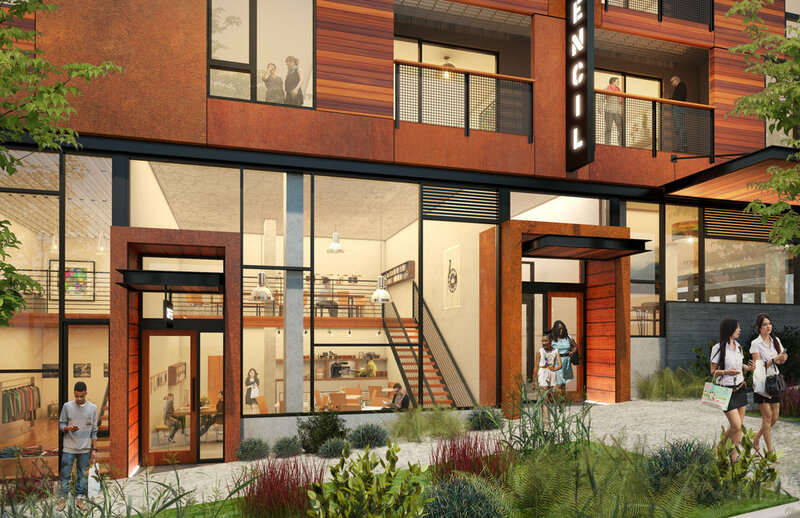 Here in Seattle we’ve seen the revival of live-work development bring with it a variety of models, but generally these types of developments place commercial space on the busiest adjacent street, with living units on the calmer side of the property and/or on the floors above. The benefits for the occupants are numerous: retailers gain the visibility and accessibility afforded by being located in a dense area, and tenants gain the convenience and increased quality of life that comes from complete, walkable communities. And with every new development that follows these basic principals comes a net benefit for the entire locale: more diversity in goods and services, a greater population to support those markets, and a community that is able to use its resources—both in regards to the raw materials used and the time and work of its residents—more efficiently and effectively. Residents use less gas driving around, and are healthier by having their work environment and their retail and recreation locations within walking distance. JA has three recently completed mixed-use developments that include live-work elements. Each project has a distinct style suited to the context and future residents. The majority of units at Stencil are flats with two live-work lofts at street level. Track-bound curtains allow the upper lofts privacy without closing off the exterior façade. Bryant Heights is a full block project with single-family homes, commercial space, condos, and eight live-work spaces. With its tight knit, active community, West Seattle is an ideal location for Charlestown, a development featuring 13 live-work units. Like other municipalities, Seattle has a set of regulations that must be taken into account in any design on this type. For example, non-residential elements of a live-work building must be less than 50% of the entire space available, and must be located on the main floor. Development standards include a 13’ floor to floor height at the street frontage and to be maintained for an average of 30’ into the space. For example, at Charlestown the retail spaces are 13’ high to a depth of 40’ while the live-work spaces have 13’ high ceilings 15-20’ into the space. 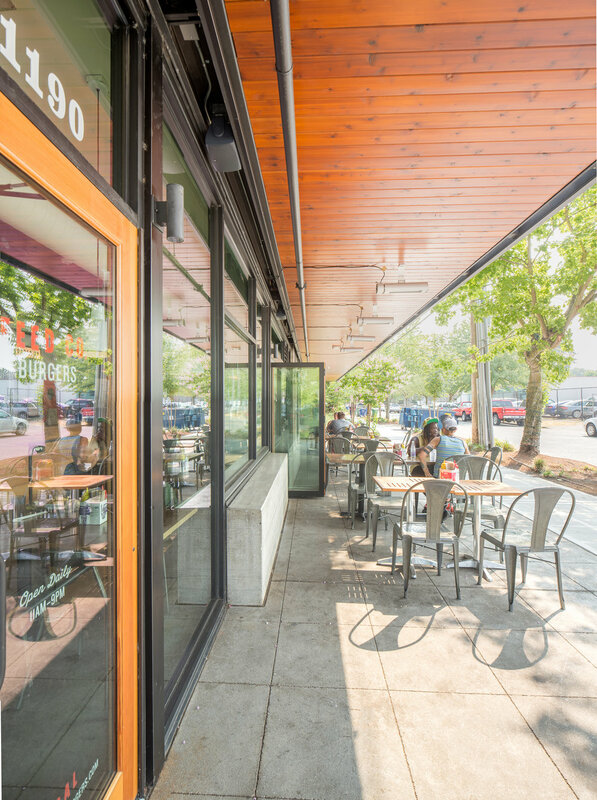 JA designers like Megan McKay have successfully navigated multiple mixed-use projects containing live-work elements through the Seattle design review process by giving extra attention to unit layout, and providing details like separate entrances for the live and work portions of projects. With the success of these spaces and the growing popularity of live-work developments as a whole, we’re looking forward to seeing and working on more of these projects in the near future.